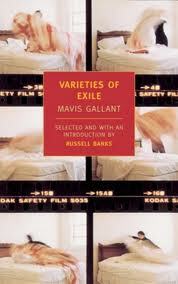 I thought I would follow up on Margaret Atwood’s comment in the last post, that up to the 1960s, if you were a writer in Canada who wanted an international audience, “it would be best for you if you left the country.” I am turning to the writer known for leaving the country, the Canadian short story writer Mavis Gallant, to see what she can add to this discussion. Gallant writes from Paris. In a 2001 Paris Review interview, she is asked why she has thrived as a writer for fifty years in France. First, she points out that it is not uncommon for writers to live in a place foreign to them. I felt it when I visited the Soviet Union; I felt then that there was no contact possible. It was under Brezhnev. And, oddly enough, I felt that there was no contact possible once when travelling in Finland. I used to travel a lot alone by car; I’d fly somewhere, rent a car, and go around by myself. But in Finland I had no language contact—French was a dead loss and I was surprised how many people didn’t speak English. It’s the only country where I cut my travelling short. I was used to just talking to strangers. … But there were other situations where I couldn’t connect and not only because of having no common language. It can happen in one’s own country too. Hmm. Feeling cut off in one’s own country (she confirms that “own country” is Canada) — could that be one of the reasons she left? Soon we will be able to read much more about Gallant’s wanderings. 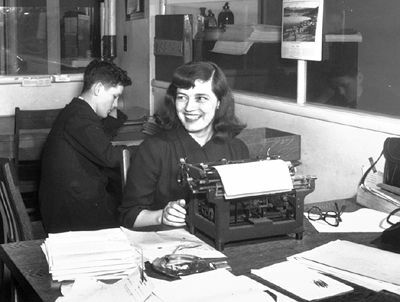 Gallant, now 90, has released her journals for publication, according to the Globe and Mail. In fact, you can already read an excerpt about her early years in Spain, when she was a starving writer, in the July 9, 2012, issue of The New Yorker. Might she be releasing her journals to forestall negative future biographies? Here is her reply to Jason DeYoung’s comment that knowing too much about a writer’s life kills interest in the work: “Oh, it does kill interests in the work.The kind of biography that is published now about writers always demolishes or demean. Sometimes the person writing the biography barely even mentions the work and the writer is so torn down or so crushed that readers lose interests in the work.” That interview was in the online zine Numéro Cinq. Oh, and here is a link to some annotated photos that appeared in Brick magazine (a more recent issue than the one the seducer was reading in Take This Waltz). 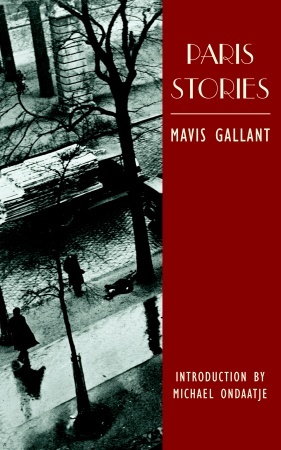 I could write a lot more about Mavis Gallant, but I’ve got to prepare for a trip to Paris. I will mention that I did an MA thesis on her fiction, published a bad essay based on the thesis, and interviewed her many years ago. Think of today’s post as whetting your appetite for more to come. Another great post D. I would love to read more about Mavis! And Jeremy and I are soon heading to the far east of Turkey where we are not expecting to be able to connect with our English, J’s Italian or his French. Enjoy Paris! I wonder about Canadian writers in Istanbul! While you are in Turkey, could you please note any posters of readings by Canadians you might see? I ask because 3 people in Turkey read this post yesterday.